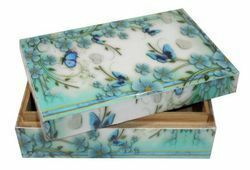 Being the leading names in industry we are involved in offering to our esteemed clients an exclusive range of Wooden Raisin Boxes. Offered product is highly demanded in market due to their different designs and long life. These are manufactured under the strict guidance of our experts using fine quality material under the supervision of our experts. In addition, these are available in market at pocket friendly prices. Wedding Season round the corner. To make your event colorful and tasteful, we have a very wide range to offer in Wedding Boxes in MDF and Raisin finish.